For many asthma sufferers, timing of these symptoms is closely related to physical activity. And, some otherwise healthy people can develop asthma symptoms only when exercising. This is called exercise-induced bronchoconstriction (EIB), or exercise-induced asthma (EIA). Staying active is an important way to stay healthy, so asthma shouldn't keep you on the sidelines. Your physician can develop a management plan to keep your symptoms under control before, during and after physical activity. People with a family history of allergies or asthma are more prone to developing asthma. 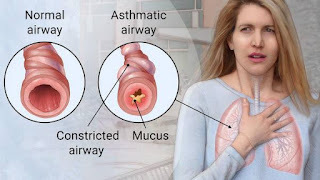 Many people with asthma also have allergies. This is called allergic asthma. COPD can be controlled when the patient leave unhealthy habits, leave the place where he attacked.